“That’s expensive.” The lady hovering around for our orders said when I told one of my friends what I wanted to eat. I looked at her, then back at my friends, and we all chuckled. 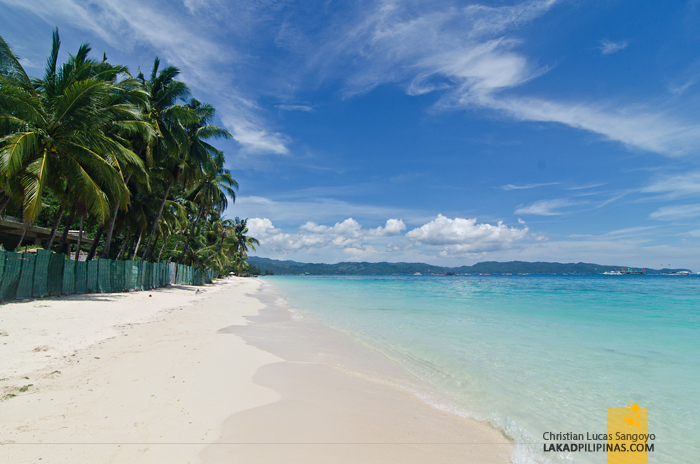 We knew we weren’t the best dressed tourists in Boracay, but that’s no way to treat customers. We let the slight pass. We were supremely famished and we were ready to eat anything. Even her. Kidding. Coming all the way from the end of White Beach’s Station 3, one of not-so-popular things to do in Boracay, we walked ourselves silly right to the happenings at Station 2 just to find a place to have lunch. We were hungry and we could’ve jumped on the first eatery we passed, but no, we wanted to eat on a restaurant unique to Boracay. J was screaming for Shakey’s, but even though he’s gonna be treating us, we dragged him away from the popular pizza parlor. “We can have that when we get back to Manila,” we chorused. 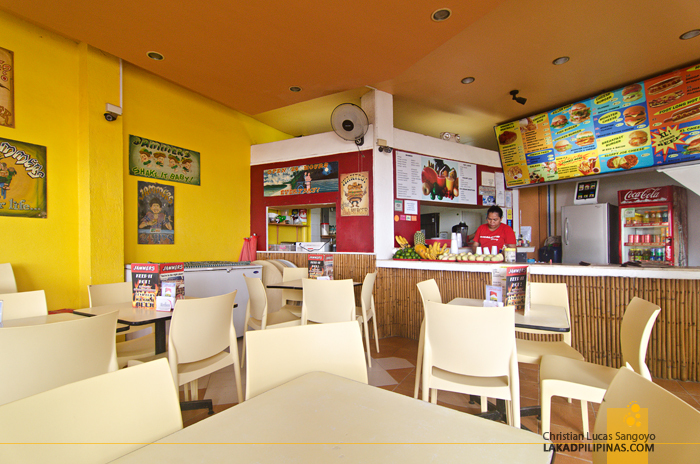 We were quite tired and extremely hungry when we finally found the perfect place to have lunch, Jammers Boracay. I’ve been passing by this burger joint right at the corner of D’Mall ever since first stepping on the island years back but haven’t really been able to try it. The reason, their burgers are expensive. It is as the lady would tell me later. But since we’re not really paying this time and our friend doesn’t seem to mind, Jammers Boracay it is! 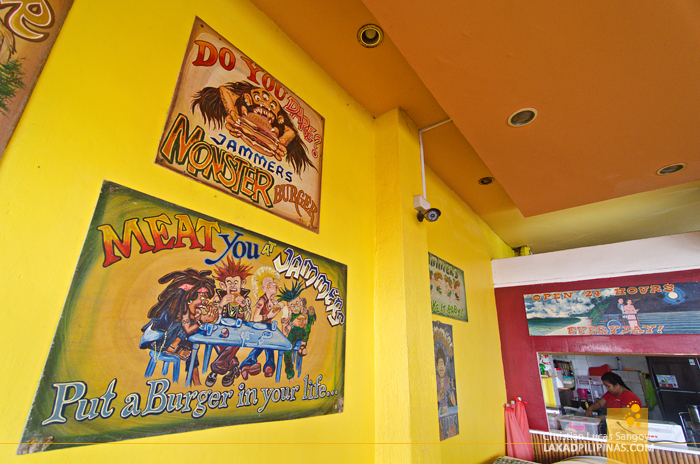 Jammers has been serving the triad of burgers, hotdogs, and spaghetti for, uhmm well, I really have no idea, but we were told they’re one of the first restaurants that opened in White Beach. They’re open twenty four hours, making it one of the go-to places for people after partying the night away at the bars in Station 2—it’s right next to Epic. 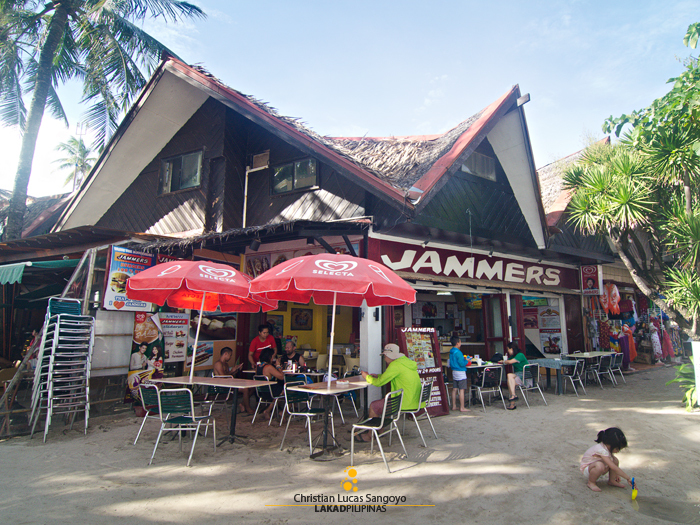 Jammers is so popular in Boracay that people have been asking if they do deliveries. Their open-aired interiors is straightforward; yellow walls adorned with outlandish paintings of three-eyed man and punk rockers eating burgers, yellow plastic chairs, formica-topped tables, and regular home tiles on the floor. If not for the bamboo finishing on their counter and the outdoor seats right by the beach, it would look like any other generic eatery from the city. 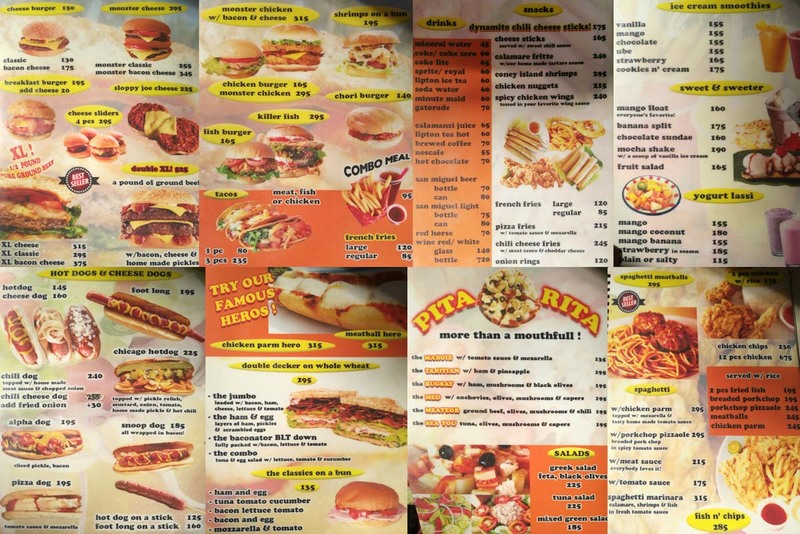 The menu consists of sandwiches, quick snacks like nuggets and fries, a couple of salads, rice meals, and spaghetti. After a quick scan, we decided on having spaghetti meatballs, bacon cheese burger, and Snoop Dog (bacon-wrapped hotdog sandwich). Serving time was average. After quick snaps of the camera, we were wolfing down our meals in no time like the penniless street urchins that the lady suspected us to be, lol. 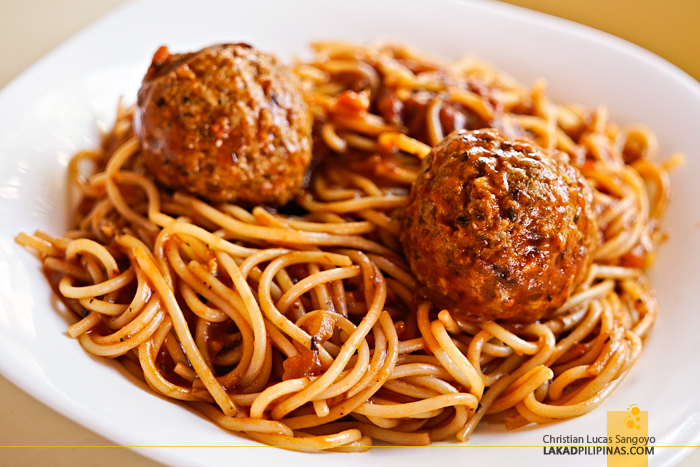 I tried the spaghetti first, a plateful of perfectly cooked pasta with two giant meatballs. And I didn’t like it. I’m really not a fan of real spaghetti, I like mine sweet, like Jollibee sweet, and with hotdogs, lol. For fans of sour spaghetti, you’ll love this. 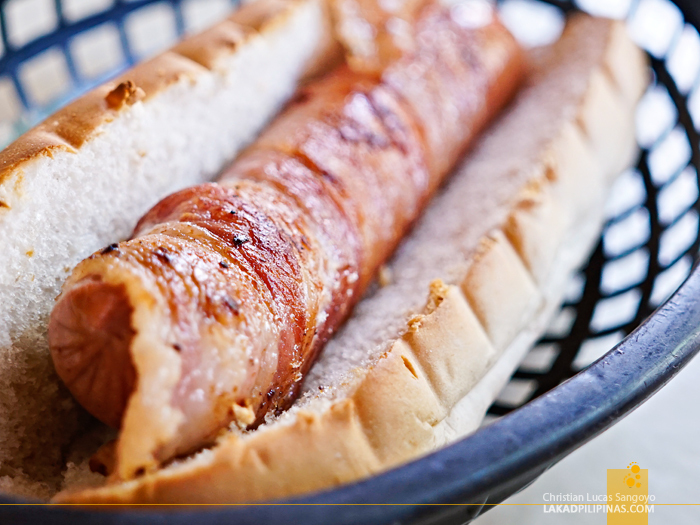 The bacon-wrapped hotdog, which was C’s order, was very dry. But it quickly went to life after we put in massive amounts of mayo, ketchup, and mustard. It went from bland to superb. I like the fact that the bacon isn’t chewy and won’t pull out after every bite. 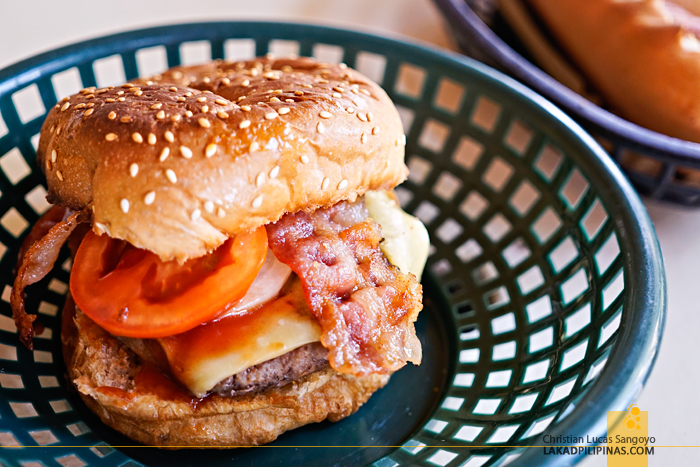 And finally, my order, the bacon cheese burger. On first bite, I found it to be really, really good. The patty was flavorful, the bacon, crispy, the cheese, just right. The veggies added fresh crunch to the whole thing. 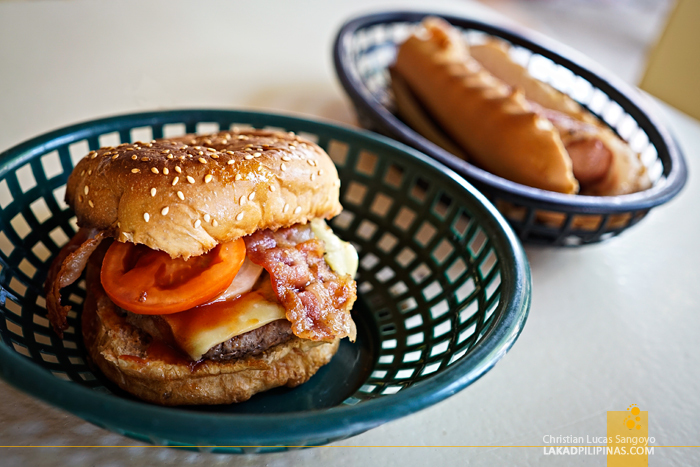 The bun seems to resemble the standard panaderia monay, but almost toasted to a crisp. The only thing I can comment about it is its size, which seemed a tad too small for its price. I guess that lady was right. This is expensive. Good, but expensive. For me, at least. LOL, that lady is "matapobre". BTW, I too only enjoy spaghetti the Pinoy way. Wow! Food looks really good. I like spaghetti maasim and medyo herb-y. Penniless street urchins wala. Haha. 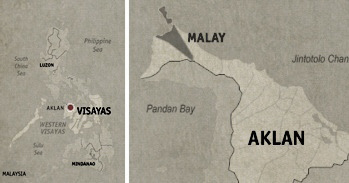 Pakamatapobre nun ah. I will never forget this place because this is where we first had breakfast the first time I was in Boracay. Oh well, it's safe to say that some people who are quick to judge are those who lack brains. Hi Mujee! Low-calorie naman ang bacons haha! Certainly worth it as a cheat day meal for those on a diet, lol.